Introduction Risk stratification in acute pulmonary embolism (PE) is useful in identifying low risk patients suitable for ambulatory care and those at high risk in need of intensive monitoring. In this study we compared two of the most well used scoring systems, the European Society of Cardiology (ESC) criteria and the simplified pulmonary embolism severity index (sPESI). Methods We retrospectively identified patients admitted to NHS Tayside over a 4 year period with radiologically confirmed PE and calculated their ESC and sPESI scores. RV dysfunction was defined by RV/LV ratio >1 on CTPA or by echocardiography. As per the ECS criteria, patients with shock (defined as SBP<90mmHg) and RV dysfunction or myocardial injury (defined as troponin I >0.045) were classified as high risk, RV dysfunction or myocardial injury without shock as intermediate risk and patients with none of the above criteria classified as low risk. Patients with any one of the six sPESI risk factors (age>80, cancer, chronic lung disease, SpO2 <90%, SBP<90mmHg, HR>110) were classified as high risk. The primary outcome was 30-day mortality or requirement for thrombolysis. Results 291 patients (45.8% male) were identified with a median age of 67 years (interquartile range 54–78 years). Low risk sPESI patients had a 2.2% risk of mortality or requirement for thrombolysis, in high risk patients (1 or more risk factors) the rate was 15.2%. Using ESC criteria, low risk patients had a 7.0% risk or mortality or thrombolysis with high risk patients having a risk of 21.2%. The positive likelihood ratio for ESC was 2.2 vs 1.6 for sPESI. The negative likelihood ratio was 0.18 for sPESI compared to 0.7 for ESC. The area under the receiver operator characteristic curves for both scores is shown in Figure 1. Both had moderate overall predictive value (AUC 0.68, 95% CI 0.63–0.73) for both scores, p<0.0001. 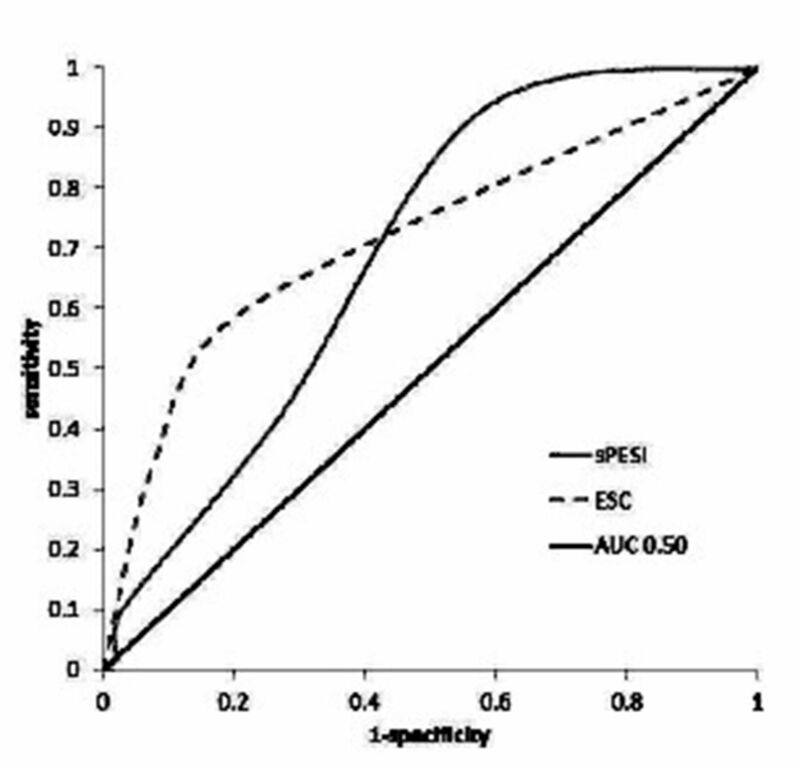 Conclusion The sPESI score is superior to the ESC score in identifying patients with acute PE who are at low risk of poor outcome, while ESC is superior to sPESI at identifying high risk patients.